With so many possible selections, it's hard to come up with a worst-of list to rank the most pathetic attempts by CNN's Jim Acosta to pose as an oh-so-tough reporter. His Friday stunt, though, was in the upper echelon for its laughable false bravado. JIM ACOSTA (cups hands around mouth, as audience is clapping): Mr. President, will you stop calling us the enemy of the people, sir? Will you stop calling the press the enemy of the people, sir? Mr. President, will you stop calling the press the enemy of the people, sir? Acosta's tough-guy schtick is well past what should have been its expiration date. 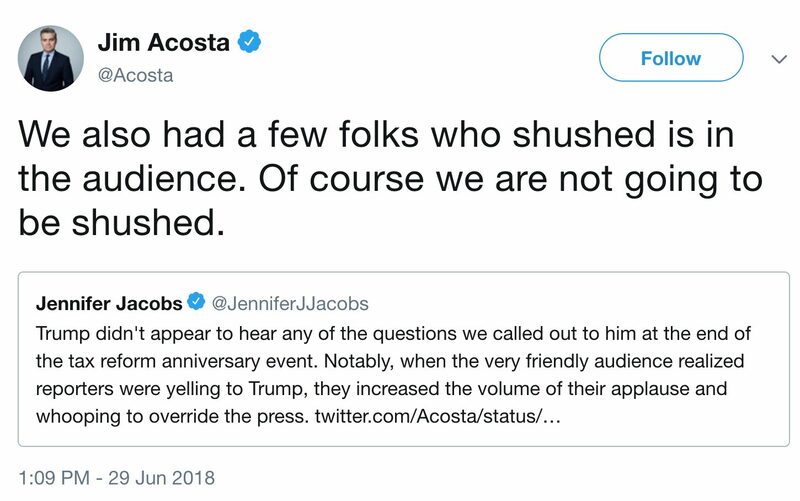 Acosta's tweet, as seen above, responded to another reporter's observation that journalists' rude shout-out tactic, like so many other actions in which press members have engaged during the Trump era, had a boomerang effect. In 2012, when then-Daily Caller reporter Neil Munro shouted out a question at Barack Obama which was actually related to the then-President's presentation on immigration matters, the rest of the press proceeded to treat Munro as a "heckler" and a pariah. Some reporters who shout at Republican presidents or interrupt ceremonial events to ask nagging questions have been treated as royalty, e.g., Sam Donaldson during the Reagan era. That is certainly not how most Americans saw Donaldson's actions when they took place. The press's habit of shouting out questions at Reagan, even at times when his helicopter was making so much noise that he couldn't possibly hear them (and they could barely hear themselves), became problematic enough that the Associated Press's Christopher Connell felt he had to publish a story defending the indefensible practice. Someone he quoted gave an equally indefensible go-to excuse: "All the regular channels of access to the president have been cut off." Boo-hoo.